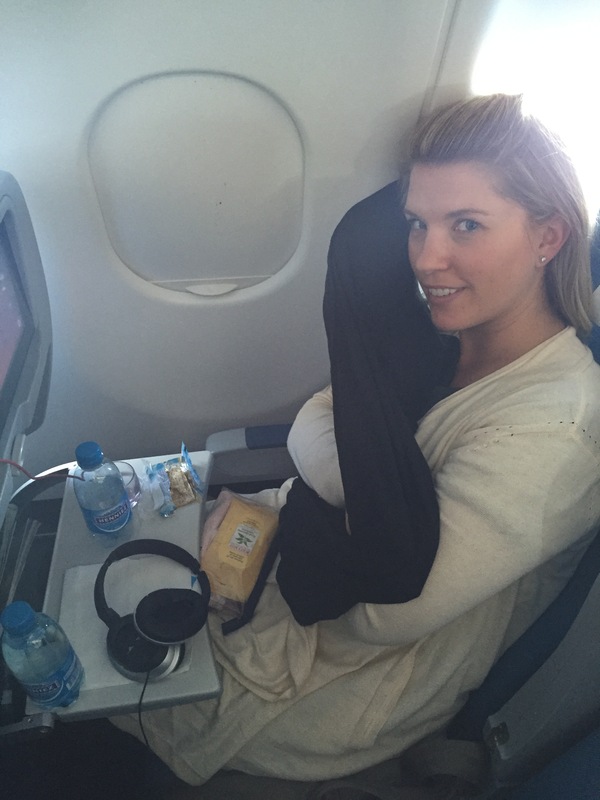 So I searched around and came across the Sleeper Scarf on A Brit and A Southerner’s travel blog. It’s an infinity scarf with a removable, inflatable pillow inside. No one will have to know you have a neck pillow. 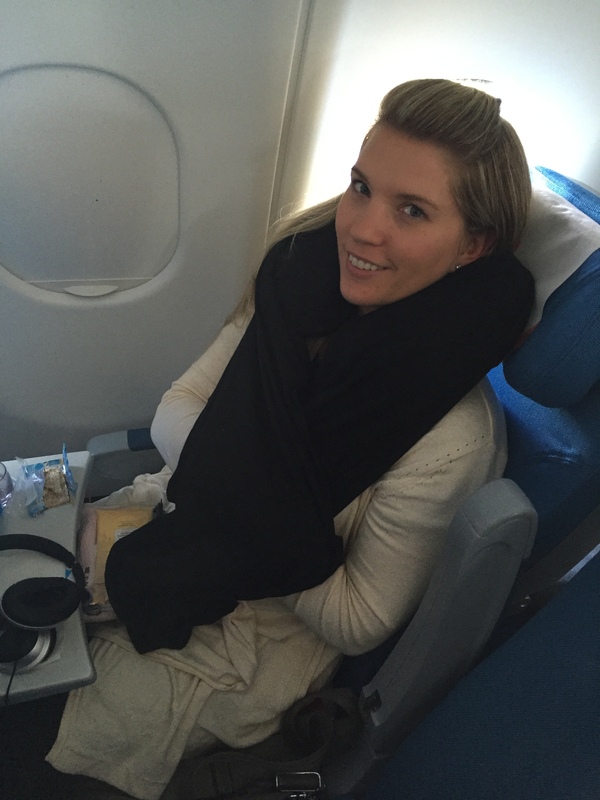 At $55 for the traditional inflate Sleeper Scarf, I found it to be a bit expensive, but I figured my vanity was worth more, so I went ahead and bought a black one for my nonstop flight from Tampa to Zurich. The scarf arrived quickly and without any issues or damage. The scarf portion is a long, heavy infinity scarf with a little zipper in the neck. You can unzip the zipper to inflate the pillow, or remove the pillow if you want to wear just the scarf. 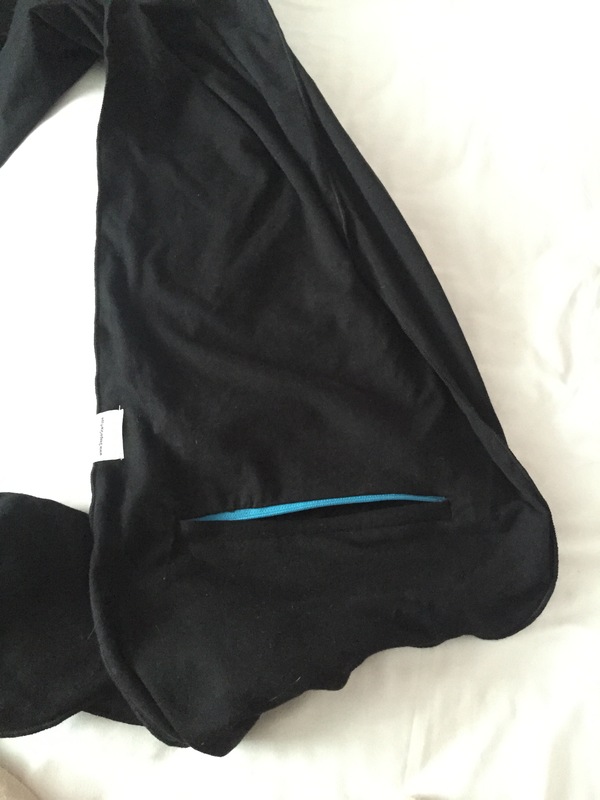 The zipper on the scarf to inflate or remove the pillow. The deflated pillow when removed from the scarf. 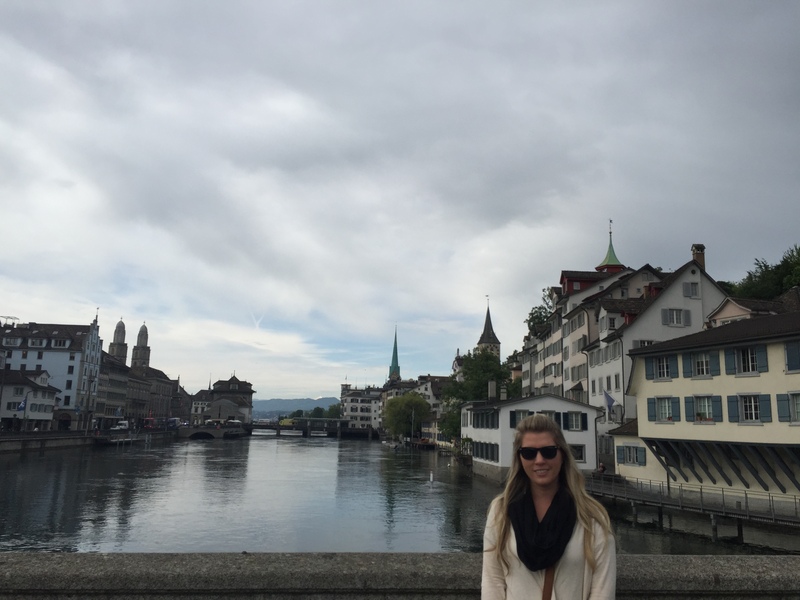 Walking around Zurich in the scarf, sans the pillow. The scarf is actually very heavy and keeps you quite warm. Very handy on a cold plane or in Buffalo, NY, but a bit overkill in Zurich in May, and our Edelweiss flight was very warm, so the scarf was too warm to use as a blanket, even though I wanted to snuggle in it. But I did blow it up and use the pillow on the flight. You can barely tell it’s a neck pillow. The best part about the Sleeper Scarf for me is the ability to adjust the inflation of the pillow. I don’t like a lot of pillow or bulk around my neck, and traditional neck pillows are too much for my liking. In fact, I found that I was most comfortable with the pillow inflated just a little, and used as a pillow up against the side of the plane. I could adjust the firmness so that my neck was comfortable and my ear was in the neck hole. It was the most comfortable I’ve ever been in coach. My perfect travel moment. The plane cooled off enough to snuggle up in my scarf and I was so comfortable. I purchased the traditional inflate pillow, instead of the easy inflate pillow for $10 more, and it was difficult to inflate. I’m sure I looked like a puffer fish trying to blow it up. If you’re already spending the $55, you might as well spend the extra $10 and get the easy inflate pillow. I also stuck with the traditional black scarf, so it would match everything. As you can see, it is super cute. But it also attracted lint, and all my renegade long blonde hairs. If you aren’t a blonde or have OCD, it probably wouldn’t bother you. But I wish I would have chosen one of the lighter colors. I would still recommend this Sleeper Scarf, even considering the cons. I do wish that I would have gotten a lighter colored one (the blue looks gorgeous!) and that I would have spent the extra money to get the easy inflate pillow. Maybe I’ll give the Husband the black one for travel use (he’s never to manly to be comfortable) and I’ll get the blue, easy inflate scarf. It would be interesting to compare the two. I’ll update you if I do! Tiffany at Sleeper Scarf had no idea I have a blog or planned on reviewing the scarf. All opinions are strictly my own. Why the fanny pack hate lol?. Anyway, that scarf is a great idea. Isaac could absolutely wear the black one, you need the blue! 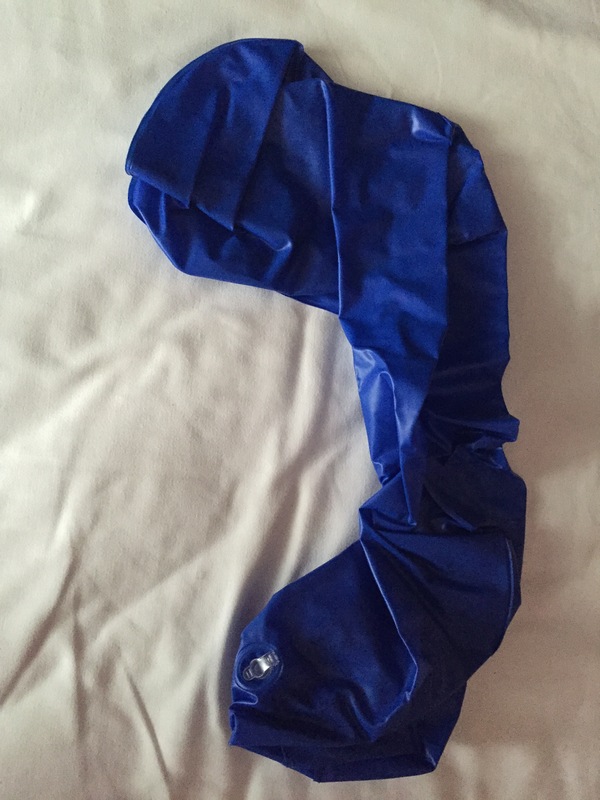 Can you use the inflatable part in one of your own scarves? I imagine that you could wrap the inflatable pillow up in your own scarf but it wouldn’t stay and would probably get annoying. This one has the sewn in zippered pocket that holds the pillow. I’m pretty sure I’m going to need the blue one before my next big trip, where ever that will be! It is! And comfy for the plane! Happy travels!